When thinking about Earth Day and how it relates to our mission here at Magic Style Shop (equipping you to improve your everyday living), I immediately knew what I needed to write about: How to Shop Smarter this Earth Day. Let’s just say I’m not the most ‘outdoorsy gal’, but I take your time and your trust seriously. We at MSS recognize you have a lot of outlets bombarding you with information on a daily (if not hourly!) basis. So when you come to us for expert advice, insider shopping tips and smarter ways to live, we don’t want to disappoint. So while I may not be able to give you a bunch of tips about how to save the earth, I can certainly stay within my wheelhouse and advise you on how to shop smarter this Earth Day. Let’s be realistic, chances are you are still going to go about much of your normal daily routine today, which will most likely involve a bit of shopping here and there. Similar to embarking upon a new diet, it’s important to add in the good before simply eliminating all the bad. Herein lies the same principle: before you tackle every negative impact you may be making on the environment, begin to add in good practices. We’ve all been known to aimlessly wander the mall for hours without a purpose. While that can be fine at times, your normal routine should be to shop with a plan in mind. Better yet, try to do the majority of your shopping online once you have those needs in mind. You’ll be saving time and money, not to mention minimizing your carbon footprint by eliminating the use of your car. Maximizing your dollars is always an important shopping tip, but especially on Earth Day. The idea is to get the most for your money AND to only buy exactly what you need, thereby lessening excess waste (product and packaging) going back into the environment). 1. Origins products are formulated with the best from Nature and manufactured with earth-friendly practices. 2. We erase waste! We recycle cosmetic empties from any brand, every day.Plus, our packaging is made from largely post-consumer recycled materials produced by renewable energy sources. 3. We plant trees…over 500,000 and counting! The trees we plant help keep our air and water clean, restore areas damaged by wildfires, and feed and house tons of cute creatures. Now that’s a brand you can get behind! 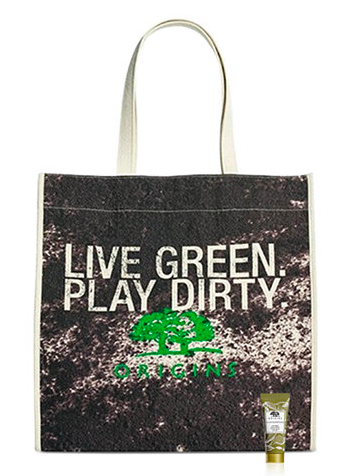 And in honor of Earth Day, Origins is offering a special to Macy’s customers: Receive a FREE Earth Day Tote with your $45 Origins Purchase! If shopping online, your gift will be added automatically at checkout with any $45 Origins purchase. So there you have it, 3 simple ways to shop smarter this Earth Day. As you can see, your shopping doesn’t have to cease just because it’s Earth Day, but with a little thought, you can still be eco-conscious in your shopping endeavors.